Unique child friendly large holiday cottage. Close to Whitby & Robin Hoods Bay. Grange Farm holiday cottages Whitby is a really spacious mid 19th Century Yorkshire Stone Farmhouse, well- furnished and full of character. The house offers self catering accommodation, for maximum 14 people, and is excellent for families and friends wanting to holiday together. The self catering accommodation has five bedrooms and two sitting rooms. The Yorkshire Tourist Board has awarded us with a 4 star rating. Grange Farm is a child friendly holiday cottage close to Whitby. We are on the Yorkshire Coast in the village of High Hawsker, which is in the North Yorkshire Moors National Park, mid way between Whitby and Robin Hoods Bay, approximately 2.5 miles from each. For those of you who like walking: Whitby, as well as Robin Hoods Bay can be reached by foot in about 1 hour. Ground Floor: the first sitting room has a 2 and 3 seater leather sofa, as well as 2 high back chairs, a TV, DVD player, and stereo/radio/cassette/CD. The second sitting room (we call it the yellow room) has a high vaulted beamed ceiling. This room has two 3 seater, and one 2 seater leather sofas, some other furniture, some children's toys , and a music centre. The spacious dining room has a wood burning stove. Wooden logs can be bought locally. There is also a book library in the dining room. The well equipped pine kitchen is next to the dining room. The kitchen is equipped with a 110cm wide gas-oven/cooker, microwave, kettle, dishwasher, fridge, freezer. There is a separate utility room which has a washing machine, tumble-dryer, iron and ironing board. A separate downstairs toilet is also located in the utility room. The house also has a large conservatory with 2 leather corner sofas and some children furniture. The conservatory gives entrance to a south facing fenced garden and patio with garden furniture and barbecue. Due to the age of the farmhouse, Grange Farm holiday cottage has some steps on the ground floor, as well as a few narrow and low doorways downstairs and upstairs, which gives the property its unique character. - One sitting room with vaulted ceiling, large leather sofa's and music system. - Dining room with log burner, and seating for 14 people. - Second sitting room also with leather sofas, a TV, DVD player and music system. - Hallway, leading to large conservatory / sunroom and a south facing fenced garden and patio area. - One family room with double bed and full-size bunk-beds, and one family room with king size bed and full-size bunk beds. - Bathroom with bath (shower over bath), sink and WC. Attic conversion (sloping ceiling), into an excellent bedroom with a king size bed, and en-suite bathroom/WC. - Bed linen (duvets) is included. - The bedrooms have a flat screen 19" TV. There also is a wash basin in each room. - You need to bring your own towels, or you can hire towels from us for £ 4 per person per week. - Electric, full gas central heating and hot water is included in the rental price. - Two travel cots, two high chairs, and a stair-gate are available. - Baby changing mat is available. - All the beds have mattress protectors. - All the bedrooms have black out blinds or curtains. - There is a children's step present in the main bathroom. - Some children's cutlery, plates and cups are present in the kitchen. - There is a hand-blender in the kitchen. - There is a book library for adults, and there are also books and toys for children. - Grange Farm holiday cottage is a no smoking area. - Sorry, but No pets are allowed. - On the starting day of your holiday, you can enter the house at 4 pm. On day of departure, please leave the house by 10 am. - Private parking for up to 4 cars is next to the house. For more information or bookings for Grange Farm holiday cottages, which is in between Whitby and Robin Hoods Bay, please contact us. PS. 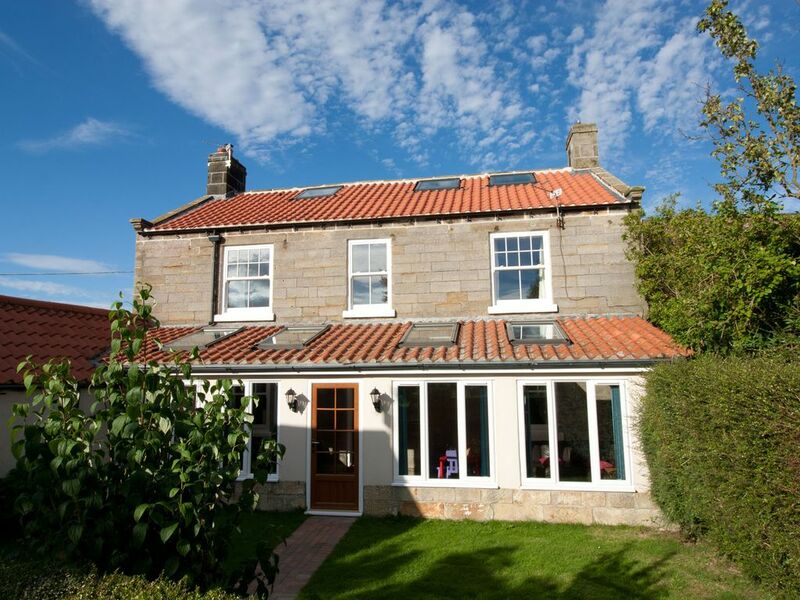 High Hawsker, Whitby is a family orientated peaceful village. Please keep this in mind when organising your holiday / weekend-break. The location of Grange Farm holiday cottages is perfect for exploring Whitby, Robin Hood's Bay and many of the other nearby villages on the coast and moors. Grange Farm is a traditional Yorkshire stone farmhouse. The house is at least 200 years old (we think), but it could even be a lot older. The house has some unique features, like exposed stone walls and door-frames of different heights and widths. Children love to play hide and seek in the house, as there are many rooms to hide in. Over the last 20 years the property has undergone extensive restoration works. Most recent works are: In 2015 the very old sash windows were replaced with modern double glazed sash windows, and in 2016 the roof of the house was renewed, and the insulation upgraded to modern standards, making the house a lot more energy friendly. The house also benefits from solar power. There are 4 WC's in the house. One in each of the bathrooms, one additional on the ground floor, and one additional one on the first floor. The house is located in the small village of High Hawsker, midway between Whitby and Robin Hoods Bay. Central heating throughout the house. Bed linen is provided, but you need to bring your own towels. There is a woodburning stove in the dining room. Some logs will be provided during the autumn and winter, and spring. Logs are also available locally. There are 2 living rooms in the house, as well as a conservatory. Gas hob with 5 cooking rings. Double gas oven, one small, and one large. Separate dining room with seating for 14 people. There is a log burning stove in the dining room. The kitchen is next to the dining room. There is a book library in the living room, and there are also some books in one of the sittings rooms. There is a selections of children toys in the house. There are also a number of games. The dining room has a wood burning stove. The kitchen has a large double gas oven with a gas hob, which has 6 burners. Excellent property which matched the description and made for a most enjoyable birthday weekend. Grange Farm Cottage was a great venue for a family weekend meeting the needs of 4 generations from 4 to 88! Very spacious with lots of separate seating areas including a sun trap conservatory, garden and BBQ area. It was nice to have the children catered for with a supply of games etc and outside play space as well. Well located just outside Whitby with a large supermarket a short drive away and Robin Hoods Bay also just down the road. There is also a range of footpaths providing access to these resorts. The local pub is 2 minutes walk. An excellent choice of accommodation and location. The property was very clean and spacious, ideal for 8 adults and 6 children ranging in age from 1-12. Lots of places for hide and seek to be played as well as plenty of children's toys and books. There is a pretty garden and barbecue space at the end of it. There is a very good pub/restaurant about 50m away and children's playground and cinder and cliff paths to Whitby and Robin Hood's Bay close by. Falling Foss Falls and tea rooms are a few minutes drive away and there are easy drives to Staithes and Scarborough. The North Yorkshire Moors are nearby and it is about 40 minutes to Rievaulx Abbey. We enjoyed our week in Yorkshire and would recommend the house to friends. Very comfortable, clean holiday home with a well equipped kitchen. The house was warm and welcoming and suitable for families, the beds ensured a good nights sleep. Various sitting areas meant plenty of room for different activities with children of differing ages. The house is ideally situated for visits to the coast or for local scenic walks. Would recommend this property to family and friends. Thank you for your writing such a lovely review. I can not take all the glory for unpacking your shopping. The Tesco delivery man helped as well, as he needed to take his crates back! Sounds like you enjoyed your stay. Falling Foss Waterfall is one of my favorite places as well. Thank you for your review. We enjoyed the fact that you all had a fantastic holiday. It is good to hear you made such good use of the all the rooms in the house. Crabbing in Robin Hoods Bay is a favourite with most children. The area around High Hawsker is ideal for cycling or walking. There are many public footpath and bridleways. A cycle hire center is just a short walk from the house. Other activities within a 5 miles radius are Rowing, Canoeing, Swimming, Golfing and Riding.